Bhopal Development Authority has come up with a new housing scheme 2016 for the allotment of 263 flats in Shahid Bhagat Singh Nagar & Patanjali Parisar Yojana 2016. The scheme comprises of 1BHK and 2BHK flats for unreserved category of the society. In this scheme, majority of 101 flats are available in Shahid Bhagat Singh Nagar and remaining 62 flats are available in Patanjali Parisar Yojana of BDA Bhopal. Most of flats in BDA Housing Scheme 2016 are 2BHK. Registration for these flats has been started from today 1 Septmber 2016 and the last date for availing hte benefits of this scheme is 26 September 2016. Applications for these flats can be fiiled through both online and offline mode. The cost of application form for online mode is Rs. 100/- for 1BHK and Rs. 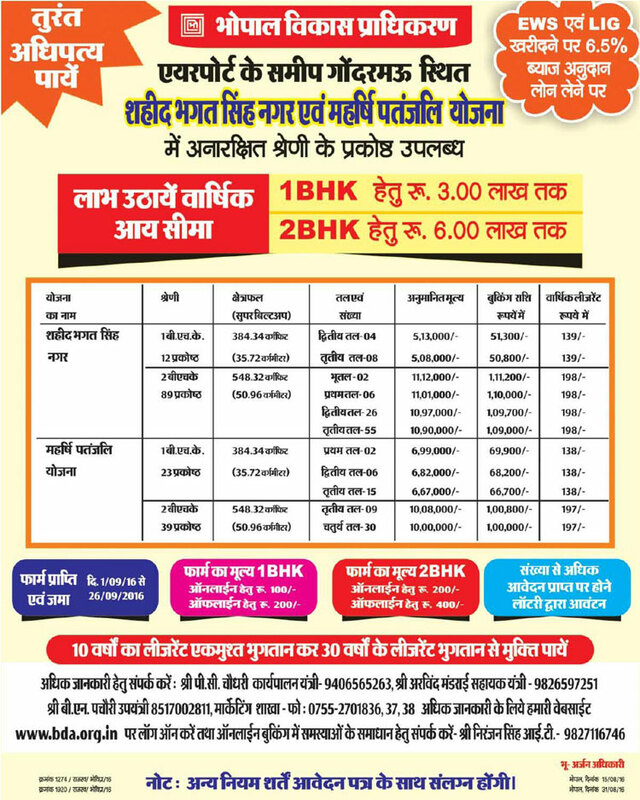 200/- for 2BHK and for offline registration, the cost of applications form for 1BHK is Rs. 200/- and for 2BHK it is Rs. 400/-. The complete information of application form can be obtained from the official website of BDA Bhopal. For more information visit the official website of BDA Bhopal.